Greetings fellow servants of the Emperor. I am glad to announce my return from hiatus. I recently changed jobs and finally got into a groove to allow me time to post more often. Rest assured I havent been idle in my absence. As idle hands invite chaos. I present the works I have been working on in the meanwhile. I am only confronted by that which plagues all model builders. Running out of room. Thank you all and hope to be more active now. Welcome back! Good job on the new models. 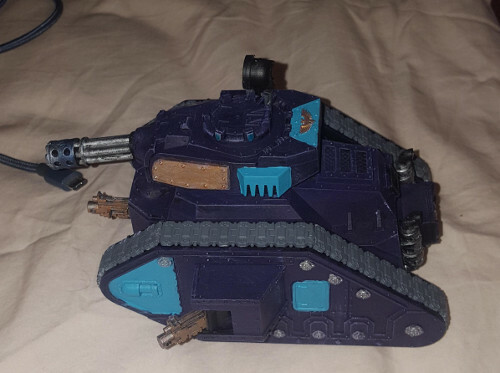 I especially like the Leman Russ with the Knight's war mask, but why does it have the mask over the driver compartment? Was the mask a gift from a Knight House, to seal oaths of friendship and alliance? Or a trophy taken in battle? Does that Leman Russ have an enhanced auspex and/or other sensors, specifically based on an Imperial Knight's? Edited by Bjorn Firewalker, 03 February 2019 - 05:23 AM. Thanks Bjorn. No the knight face plate is just a trophy. It's over the drives compartment for added armor, nothing more. 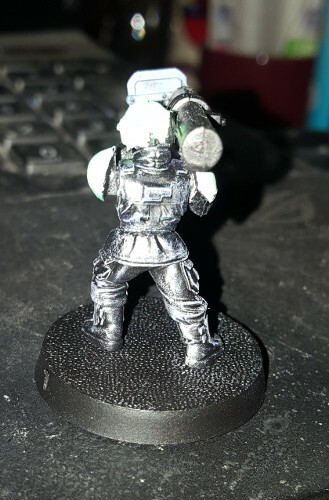 I'm impressed your Leman Russ Exterminator (or is it the twin lascannon-armed Annihilator?) managed to kill a Renegade Knight- I thought a Demolisher or Vanquisher's firepower would be necessary to accomplish such a feat. It was a joint effort. Those blasted shields they have require flanking to get around. And it is indeed an Annihilator. I personally do not like the Externiator. If I wanted autocannons I have sentinels and HWTs for that. Welcome back Zac, looks like you've been busy which is good to see When was the last time you played, or haven't you had time? So many uncharted planets and regions of space. Which side of the Crux Maledictum is Battlezone: Hiatus? How many worlds did you liberate? Have you returned to resupplying before you head out again or have the Lord's of Terra tasked you with something else? The rules don't change too often, and when they do it's not a great deal - it's pretty stable for regular enough play I find. Even Chapter Approved doesn't do all that much (especially if you use Battlescribe, so you don't even need to remember point changes ). Good colors on the Punisher. Is it the one with Adepta Sororitas gunners from the Order of the Blushing Maiden? How are you finding the punisher in 8th? I haven't used one since the very few games I played in 7. 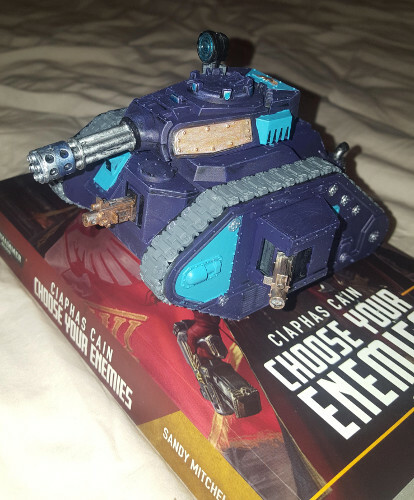 Do you think it worth trading out a plasma or battle cannon russ for? I think I played one game of 8th when it first started. And while I miss Pask's Rending the punisher does excel at clearing hordes IF properly kitted and fielded. For example focusing strictly on Dakka. The Punisher cannon is 20 shots. Each heavy bolter which is the same strength is 3 shots X3 for 9 more shots. A heavy stubber grants 3 more shots for a grand total of 32 shots per Russ. Put in a squadron of 3 thats 96 dice rolling. In previous editions I have wiped out Nid's and Terminator squads and whittled down Necrons rather fast with them. The problem comes from not having enough points to bubble wrap them with my own horde of guard OR have enough points left over for adequate Armor nullification. HAHA No this is a different punisher that is part of a different story me and some one I met on F-list is making. Housekeeping first, Zac I merged your most recent topic with your previous one. Feel free to use the full editor on your first post to rename the thread to signify its your WiP thread if you wish. Keep up the good work! Whats next? 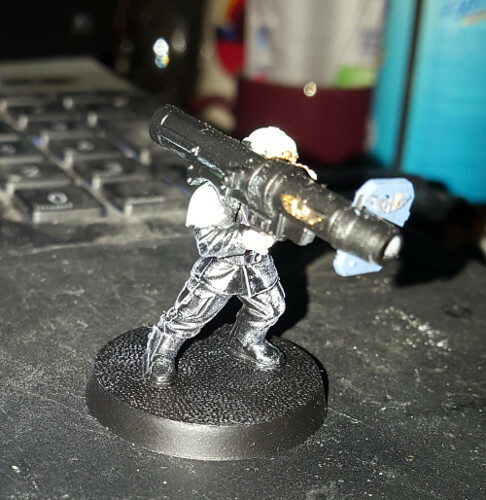 Did some dry brushing of my heavy weapon teams. Kept the black uniform and accented them with a dry brush of Ceramite White. The flash doesn't do these guys justice and without it my camera is too dark to really show it. Edited by CommissarZac, 13 February 2019 - 10:42 AM. Good job on the Punisher. Are the copper plates on the turret meant to commemorate a great victory or honor fallen brothers and sisters-in-arms, meaning you'll add decals or freehand letters and/or inspirational images on them? Or are they extra armor plates your tankers received from a different regiment, and the crew is yet to repaint them? In the latter case, I can see your tankers choosing to leave the plates in the other regiment's colors, to honor its contribution. They're more for Platoon/squadron designation. HQ platoon gets (it should be gold, I layered silver, copper, then gold to make it shine.) Gold, The rest get other colors I havent decided yet. Edited by CommissarZac, 15 February 2019 - 11:34 AM. They're more for Platoon/squadron designation. Good idea. As for others, silver is one obvious choice, as are a metallic red (for orichalcum) and a metallic green (for bronze). I would not recommend reusing copper, as gold may be confused with it in field conditions (covered with dirt, possibly corroded due to Tyranid acid attacks, etc. ).